Big Big NEWS!! I didn’t want to spoil the surprise but it looks like @Poshmark has listed their line up for this weeks Posh Parties and I will be hosting solo this Thursday February 12, 2015!! Yipee! This means that I need you guys to tag me on all the items you want to be considered for the “Office Style” theme! I can only do 3 listings from one closet so please only tag me on your best 3. Don’t get greedy now! In celebration of me hosting I wanted to give away a benefit package! 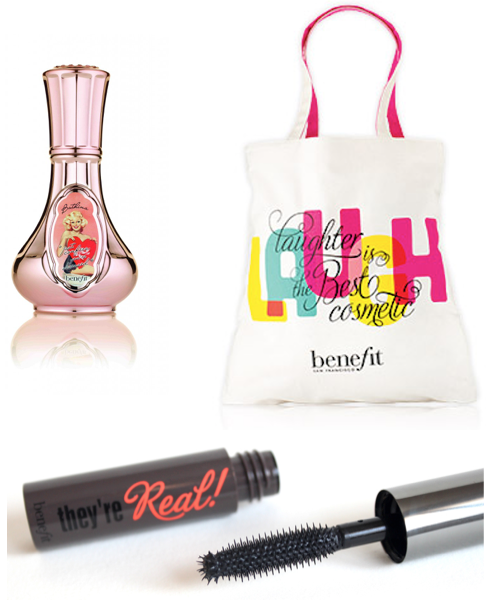 Benefit package going clockwise, Bathlina Body Mist, “Laughter is the Best Cosmetic” Canvas Tote Bag, and They’re Real Beyone Mascara. I just love give aways!! Also if you haven’t seen it yet, the NEW video for HealthyGirlTV is out and I hope you subscribed! If you haven’t seen it yet it’s all about packaging and shipping etiquette, so make sure you (politely) share this with anyone that you think may need a hint hint 😉 lol! Thanks so much for reading and don’t forget to tag me on your listings you want considered, I want your stuff to get sold!!! What a fabulous giveaway! Can’t wait for your party, love! Best way to stay healthy is WATER! This is such a great idea!! Shared to Pinterest and my favorite way to stay healthy is by running with my dog Onyx!! I avoid boxed foods and buy fresh fruits from local produce shops. They buy locally grown fruits and veggies, they are ️not waxed. These are not organic or “high end”, very affordable and cheaper than main or luxury supermarkets. I take Barre, Pilates and Yoga classes two to three times a week and those are my favorite ways to stay healthy and active! Good luck with the party! WooHoo! I’ll share the news! I plan to be there also! This is awesome! Can’t wait for the party. I stay healthy by getting active in softball year ’round. Thanks for all your great info – here and on your YouTube channel! My favorite way to stay healthy is to cook the majority of my own meals using fresh ingredients. I love to cook! Love the giveaway idea! Your hosting on my birthday!!!! Yeah! Can’t wait to go posh shopping for my birthday! The way that I stay healthy is to walk every day (my two fur babies “motivate” me to get out and walk them 3 times a day! ), drink lots of water, and eat my favorite things – in moderation. After trying every diet under the sun, I’ve found that you don’t have to restrict yourself all the time from enjoying great food, as long as you eat healthy on a regular basis (lean protein, fruits, vegetables, grains, etc) and allow yourself to have some of your fav’s – just in moderation. Thanks so much for offering this giveaway opportunity and also for all the tips you have in your closet, on this blog, and I LOVE your youtube sessions. Have an absolutely fabulous party! I stay healthy by exercising daily, drinking green smoothies, and keeping a positive attitude. Thank you so much for the giveaway! Hi Andrea! This is Ediza from HealthyGirlTV, just wanted to let you know you are our WINNER for the HealthyGirlfashion.com Benefit Prize Giveaway! Please message me back ASAP so I can get an address to send them over to you! shared on twitter!! My favorite way of staying healthy is by taking out sugary drinks. Ive also been trying to drink more kefer and kombutcha to have more good bacteria in my body. thanks for the giveaway! HI fellow posher! So excited for your party tonight. Can’t wait to see your picks! What helps me stay healthy is meal planning. If I don’t have dinner lined up, I’ll end up eating convenience foods or take out, which is bad for my body and budget! Staying Healthy Is Not Always Easy With Painting For Hours On End. But I Make Sure I Have Ready -Made Sandwiches And Dinners. Sushi And Fruit Smoothies Are My Favorite. I Always Feel Good After A Good Sushi Dinner Or Lunch. I Also Try And De-Stress, And I Do That With My Art And Doing Things Like Sharing On Posh.